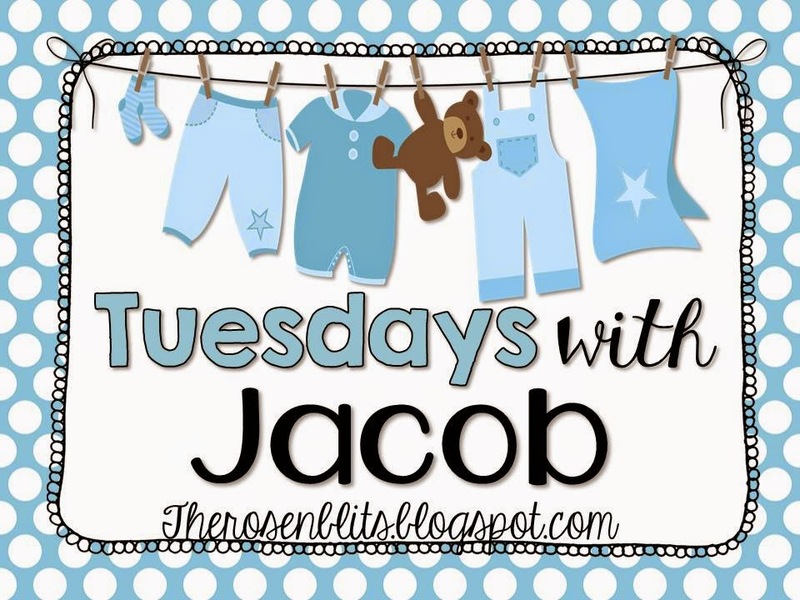 We started this week with Jacob's 3 week well-child check up. He gained a pound and grew an inch! Now he's 9lbs, 8oz, and 22" long! 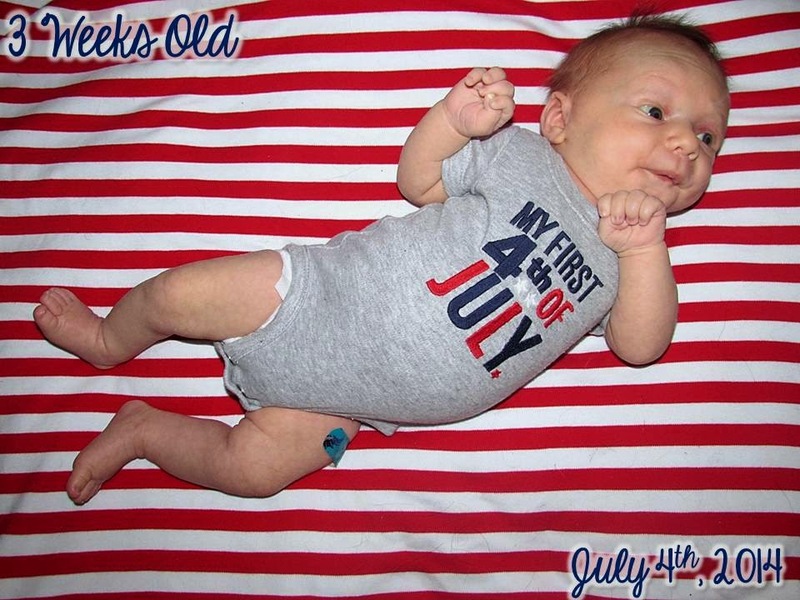 His newborn panel came back normal and he got his first vaccination - Hepatitis B. You screamed of course, but then you cuddled into Mommy and fell asleep. The dr. also used some alcohol to clean out the rest of your umbilical cord and now your belly button is all clean! Done with this shot business and ready to go home!! You're going through your three week growth spurt, which means you are eating a lot - every hour to hour and a half instead of every two to three hours. And you are sleeping not nearly as well - half hour to hour naps instead of two to three hours. You are also getting more alert. Instead of falling right asleep after eating you are usually awake for half an hour to an hour. Sometimes you like to do Tummy Time, and sometimes being on your tummy just makes you fall asleep! Your puppies definitely love watching you when you are down on the floor! On Friday it was the Fourth of July! 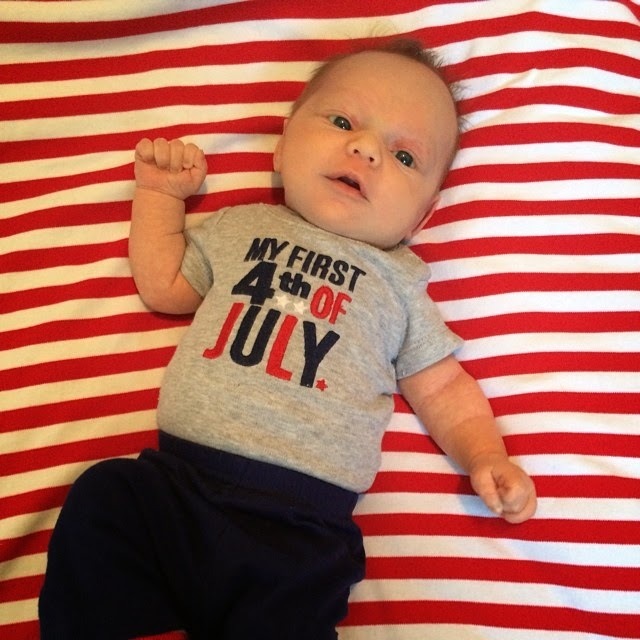 Your pediatrician doesn't want you going anywhere with big crowds until you are two months old so we skipped the festivals and parades and relaxed at home. We took you for a walk in the evening, and of course you fell asleep. You slept right through fireworks even when we took you for another walk after dark to look at some in our neighborhood. The noise didn't bother you one bit! On Sunday Daddy was home with us and we had a nice brunch while you took your (short lived) morning nap. On Sunday Pop-pop and Mimi came over for a belated 4th of July. 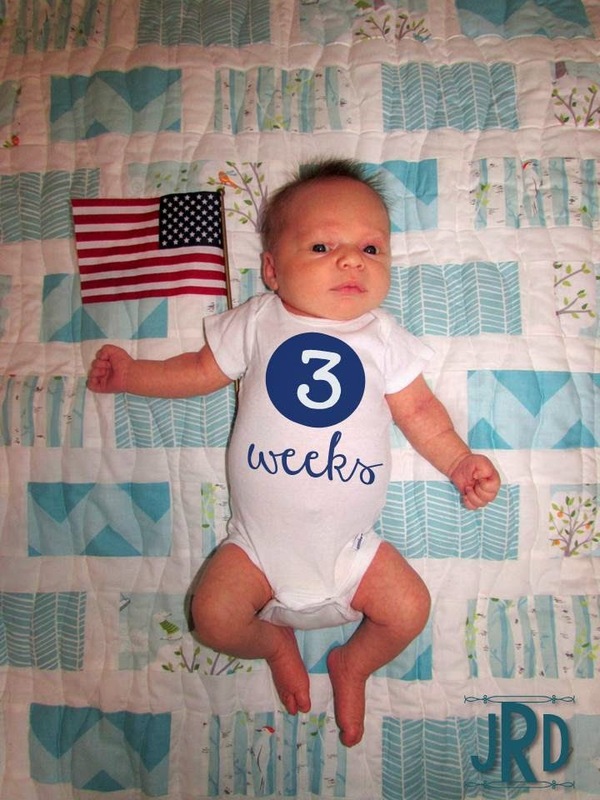 Your newborn diapers and clothes are starting to get a little snug... we think you'll be in 0-3 month clothes and size 1 diapers by the next week or two!